When growing in ideal conditions, the popular London Pride spreads to form carpets of rosettes with spoon-shaped leathery leaves. In early summer, it is covered with sprays of long-stemmed tiny white flowers with pink centres. Moist, fertile soil in full or part shade. Will tolerate quite dry conditions once well established. Hybrid between Saxifraga umbrosa and Saxifraga spathularis. 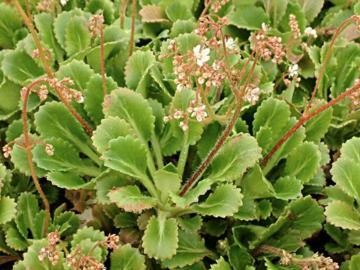 Saxifraga umbrosa is also known as London Pride or "True" London Pride.